(a) Remove the windshield wiper motor and link assembly (See page ). Do not forcibly bend, kink or twist the fuel tube. (a) Remove the No. 2 fuel pipe clamp. (b) Wipe off any dirt on the fuel tube connector. (c) Hold the fuel tube connector, and then install SST. (d) Turn SST to align the retainer inside the fuel tube connector with the chamfered part of SST. (e) Insert SST into the fuel tube and hold it. Then push the fuel tube connector toward SST. (f) Mount the retainer of the fuel tube connector onto the chamfered part of SST. (g) Slide SST and the fuel tube connector together toward the fuel tube until they make a "click" sound, and then disconnect the fuel tube. 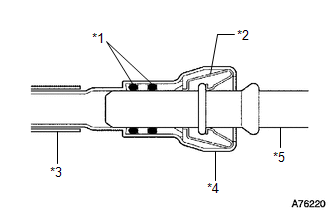 Check for foreign matter in the fuel tube around the fuel tube connector. Clean it if necessary. Foreign matter can affect the ability of the O-rings to seal the connector and fuel pipe. Do not use any tools to separate the connector and pipe. Do not forcibly bend, kink or twist the hose. Keep the connector and pipe free from foreign matter. If the connector and pipe are stuck together, pinch the connector and turn it carefully to disconnect it. Put the connector in a plastic bag to prevent damage and contamination. (h) Remove the No. 1 fuel pipe clamp. (i) Pinch the tube connector, and then pull the tube connector off of the pipe. Check for foreign matter on the fuel tube around the fuel tube connector. Clean it if necessary. Foreign matter can affect the ability of the O-ring to seal the fuel tube connector and fuel pipe. 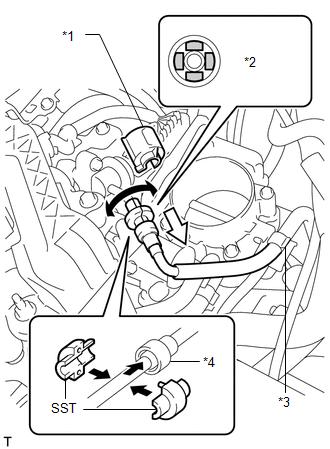 Do not use any tools to separate the fuel tube connector and fuel pipe. Do not forcibly bend, kink or twist the nylon tube. 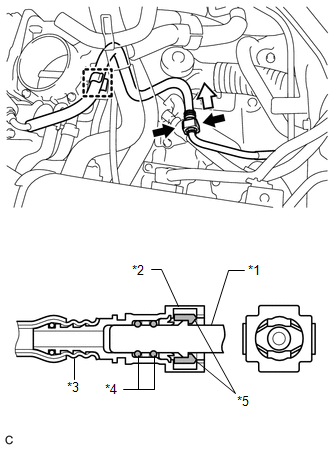 If the fuel tube connector and fuel pipe are stuck, push and pull to release them. Put the fuel tube connector and fuel pipe in plastic bags to prevent damage and contamination. 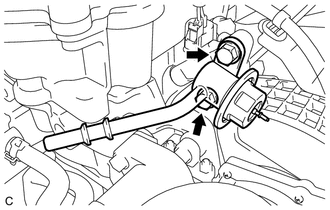 (j) Remove the fuel tube sub-assembly from the fuel hose clamp. (a) Remove the 2 bolts and fuel pressure pulsation damper assembly. (b) Remove the O-ring from the fuel pressure pulsation damper assembly.